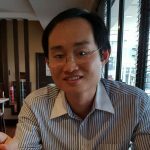 Here is a list of products showcased by Malaysian companies at the recently concluded Thaifex – World of Food Asia exhibition. The premier food expo, the largest in Thailand, was held from 31 May to 4 June 2017. 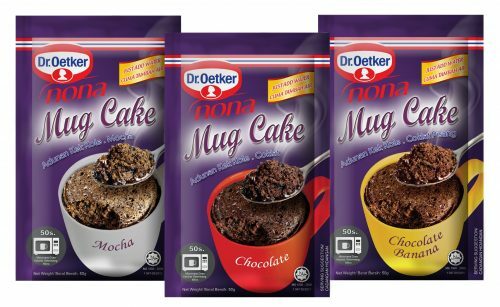 Dr. Oetker Nona Malaysia Sdn Bhd displayed its latest microweavable mug cakes. The mug cake offers consumers a fast, easy and convenient way to enjoy a cake in 50 seconds. Just add water to the mug cake premix and microwave it for 50 seconds. The three flavours are chocolate, chocolate banana and mocha. The mug cake was among the top 50 THAIFEX Innovative Products for this year. 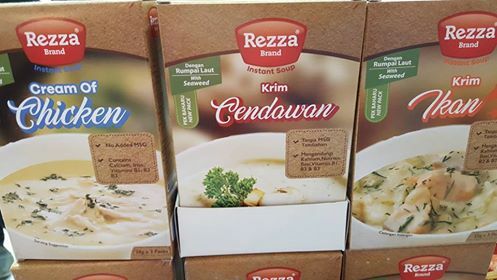 Bio Haruantech (M) Sdn Bhd, the owner of the Rezza brand, unveiled its range of instant dry soup mix comprising mushroom, chicken and fish. 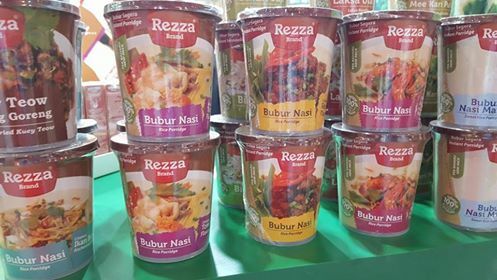 The Rezza instant soup range was introduced at MAHA 2016, Malaysia’s leading agricultural show. The fish instant soup is the first of its kind in the Malaysian market. 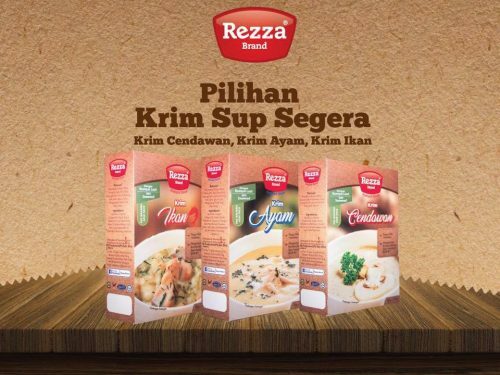 The entry of Rezza provides consumers with an alternative to Campbell’s instant soup, which has been dominating the market following the exit of Ajinomoto’s Vono brand. 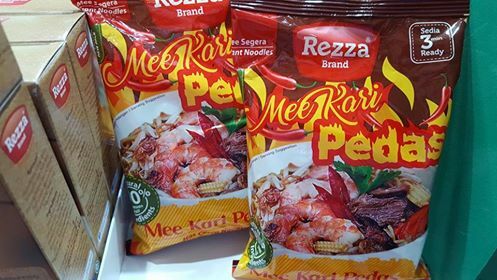 Also available was the Rezza Mie Kari Pedas. I was told this instant noodle was first conceived as a product for Palestinian refugees but was later made commercially available for the Malaysian market. The packaging of the existing Rezza range of cup instant noodle was upgraded to a more robust PP packaging from food grade polystyrene. 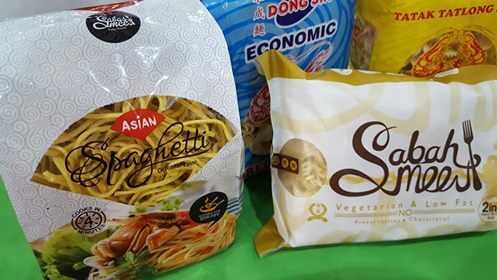 Sabah-based DongSin Food Sdn Bhd showcased its quick prepared Asian Spaghetti Oriental Taste, which cooks in 4 minutes. The serving size is 70g. The ingredients are wheat flour, salt, potassium carbonate and lemon yellow. The wheat grains used in the noodles are imported from Australia. The noodles are suitable for stir fry the Asian way. Also on display was Sabah Mee, a low fat, vegetarian instant noodle ideal for both dry and fried base. The noodles are free from preservatives and has no cholesterol. Each pack weighs 210g and contains four pieces of noodles ideal for the entire family. The ingredients are wheat flour, salt, sodium carbonate and colouring (tartrazine). 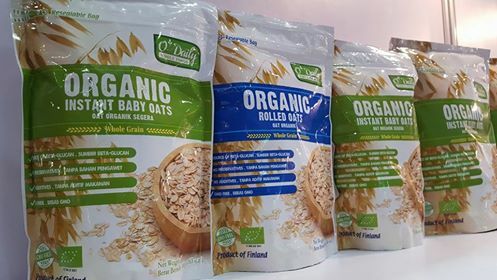 TenTen Food Manufacturing Sdn Bhd introduced its O’Daily Organic Instant Baby Oats and Organic Rolled Oats, known to be a good source of beta glucan. The oats are free from GMO. 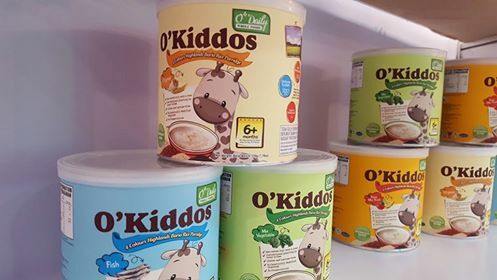 The other products at Thaifex 2017 was the O’Daily O’Kiddos 4 Colours Highlands Bario Rice Porridge – Original, Mix Vegetables and Pure Mix Fruit. The Bario rice is harvested only once a year and is planted conventionally by local tribes. The rice is free from gluten and lactose with no GMO and preservatives. The rice porridge is suitable for babies aged 6+ months and above. TentTen is famous for its TenTen jelly pudding and has added instant oatmeal to tap the healthy eating trend.